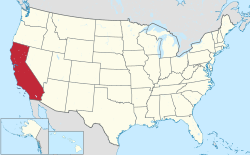 California is a state located in the Western United States. It is the most populous state and the third largest by area after Alaska and Texas. According to the 2010 United States Census, California has 37,253,956 inhabitants and 155,779.22 square miles (403,466.3 km2) of land. 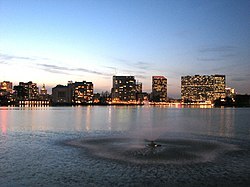 California has been inhabited by numerous Native American peoples since antiquity. The Spanish, the Russians, and other Europeans began exploring and colonizing the area in the 16th and 17th centuries, with the Spanish establishing its first California mission at what is now San Diego in 1769. After the Mexican Cession of 1848, the California Gold Rush brought worldwide attention to the area. The growth of the movie industry in Los Angeles and Hollywood, high tech in San Francisco and Silicon Valley, tourism, agriculture, and other areas in the ensuing decades fueled the creation of a $1.85 trillion economy, the ninth-largest in the world. California is divided into 58 counties and contains 482 municipalities. 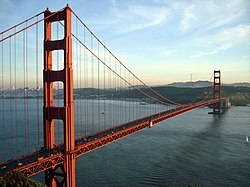 One, San Francisco, is a consolidated city-county. California law makes no distinction between "city" and "town", and municipalities may use either term in their official names. They can be organized as either a charter municipality, governed by its own charter, or a general-law municipality, governed by state law. According to the 2010 Census, 30,908,614 of California's 37,253,956 residents lived in urban areas, accounting for 82.97% of the population. The first municipality to incorporate was Sacramento on February 27, 1850, while the most recent was Jurupa Valley on July 1, 2011. Eight cities were incorporated before the state's September 9, 1850, admission to the Union. The largest municipality by population and land area is Los Angeles with 3,792,621 residents and 468.67 square miles (1,213.8 km2). The smallest by population is Vernon with 112 people, while the smallest by land area is Amador City at 0.31 square miles (0.80 km2). ^ a b c d "GCT-PH1 – Population, Housing Units, Area, and Density: 2010 – State — Place and (in selected states) County Subdivision". 2010 United States Census. United States Census Bureau. Retrieved January 16, 2012. ^ "San Diego Presidio". National Historic Landmarks Program. National Park Service. Archived from the original on July 21, 2011. Retrieved January 20, 2012. ^ "2010 California Economy Rankings" (PDF). 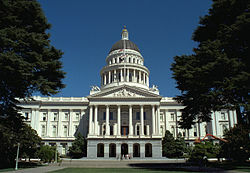 California Governor's Office of Business and Economic Development. Retrieved June 13, 2012. ^ "Learn About Cities". League of California Cities. Retrieved June 13, 2012. ^ California Government Code Sections 34502 and 56722. ^ California Government Code Sections 34450 and 34500. ^ a b "California Cities by Incorporation Date". California Association of Local Agency Formation Commissions. Archived from the original (Word) on February 21, 2013. Retrieved June 13, 2012. ^ "Census 2010: Table 3A — Total Population by Race (Hispanic exclusive) and Hispanic or Latino: 2010". California Department of Finance. Archived from the original (Excel) on November 24, 2011. Retrieved January 16, 2012. ^ "Corrections to 2010 Census Population and Housing Units Counts in the State of California" (PDF). California Department of Finance. Archived from the original (PDF) on May 16, 2013. Retrieved January 16, 2012. ^ a b "City of Eastvale" (PDF). Riverside County Transportation and Land Management Agency. Archived from the original (PDF) on May 14, 2013. Retrieved January 20, 2012. ^ a b "City of Jurupa Valley" (PDF). Riverside County Transportation and Land Management Agency. Archived from the original (PDF) on May 14, 2013. Retrieved January 20, 2012. ^ Long, Percy V. (1911). "Consolidated City and County Government of San Francisco". Proceedings of the American Political Science Association. 8 (Eighth Annual Meeting): 109–121. doi:10.2307/3038399. JSTOR 3038399.